It has come to our attention that Christie’s has removed the below-reported Waldseemüller gores from its upcoming sale. 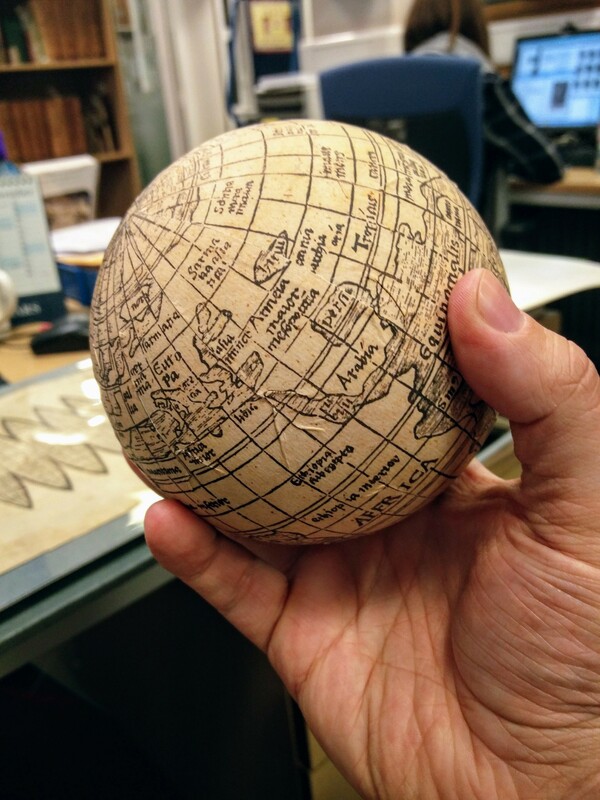 The New York Times and other outlets released reports yesterday evening that an ongoing investigation into the authenticity of the sheet has raised some serious concerns over the possibility of this copy of the 1507 globe being a forgery. Similarities in damage to another copy of the gores sheet in Minneapolis, and, more convincingly, the fact that the printing of the Christie’s gores seems to have been done over top a later glue fragment have been found by scholars and antiquarian sellers. However, it is important to us here at Thinking 3D, that the value of this style of map, whether we are talking about the copy at the Bavarian State Library or Minneapolis or the new possibly forged Christie’s copy, can hardly be understated in the development of three-dimensional communication at the intersection of geography and geometry. The mathematical skills that Waldseemüller brought to bear on his map-making is central to our core research. We hope that the below article will stand as a testament to our enthusiasm for this map and the moment in time when the now questionable discovery at Christie’s brought international attention to this unique item. A little under a month ago Christie’s London announced the discovery of an extraordinarily rare 16th century map which will be offered for sale next month. When we heard about the discovery of this gem, we reached out to our contacts at Christie’s, and last week I had a chance to visit and see this fascinating survival up-close and in-person. The map in question is the earliest depiction of a gores-style projection of the earth – imagine taking an orange and unfolding all the pieces and flattening them on the table – the idea being that you can project all the landmasses on Earth to proportion and also provide a template to turn the sheet into a globe. The map, engraved by Martin Waldseemüller in or around 1507, is a very rare survival – now the 5th known of its kind, and is also incredibly significant for being the first map to depict and label North America. This method of dissecting and communicating a sphere’s constituent parts via a two-dimensional medium was a very popular practice of geometers and artists working at the end of the 15th and beginning of the 16th centuries. A similar technique, subdividing the globe into eight parts, survives attributed to Leonardo, or perhaps his pupil Francesco Melzi, in the Royal Collection from the first half of the 16th century; and Albrecht Dürer, in his elaboration of various geometrical shapes in the 1525 Underweysung der messung, produces a set of gores and describes them as the width of the twelve sections to be exactly double the height of any one section. 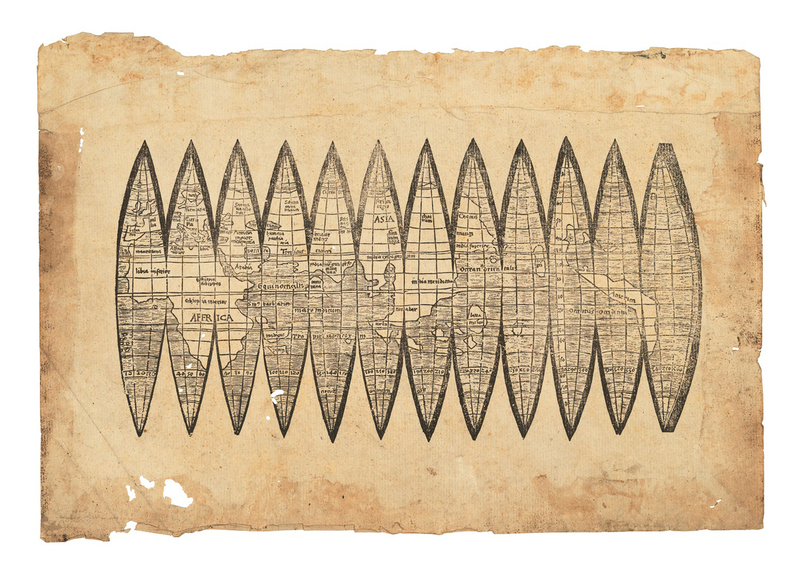 The chance to see this newly discovered copy of the Waldseemüller gores map was a real treat. The sheet was smaller than I expected and has survived particularly well having lived most of its life as binding waste (its survival is likely thanks to the fact that it was last kept by picture restorer and collector Arthur Drescher). 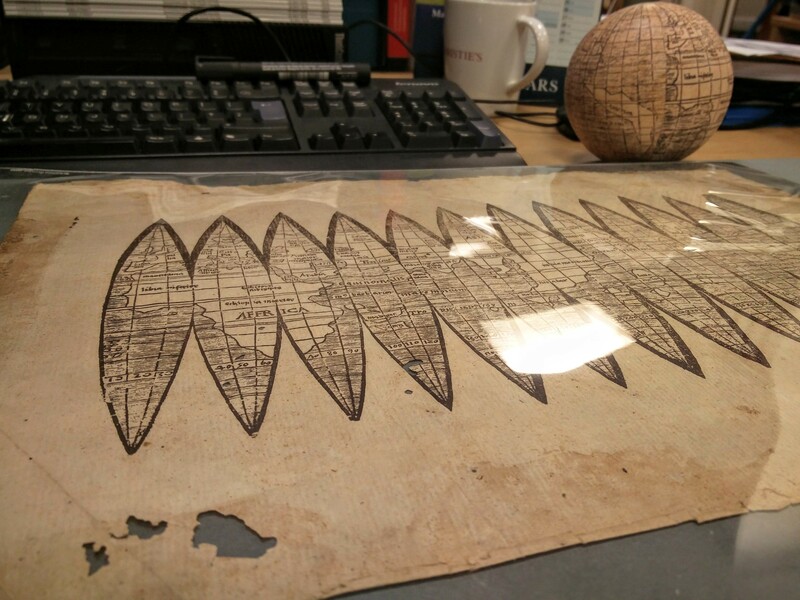 The impression of the woodcut is deep and clear in the hand-laid paper, and one could easily imagine carefully cutting out the individual pieces and making a home-made globe out of them (which is likely what happened to most of the now-lost edition); the team at Christie’s had even done this themselves with a printout of the original, for a pretty effective example! Geometry, geography and three-dimensionality progressed hand-in-hand, especially in terms of illustration and depiction from the early Renaissance throughout the 20th century – and the chance to see what could be construed as the starting point for the confluence of these disciplines in the realms of geography in print was an amazing opportunity. Many thanks are due to Julian Wilson, James Hyslop, and Meg Ford at Christie’s Books for the invitation. The Waldseemüller map goes on sale on 13 December 2017, lot 97.